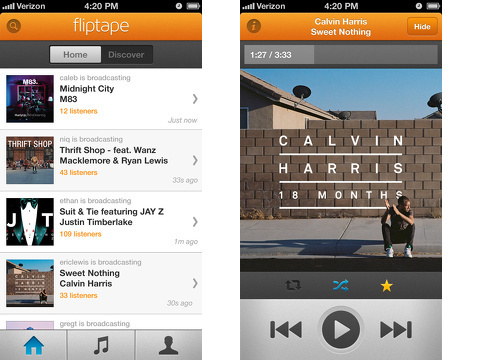 Fliptape is a promising, free iPhone app for Spotify Premium subscribers to experience music. You will quickly be playing music as a result of the simple navigation, but a couple of wonky gestures and the absence of curated artists make it feel less polished. The Fliptape iPhone app has a straightforward authorization process, but it misses a key step with required information. You must log-in through your Facebook or Spotify account. Next, you create a profile similar to Twitter. The required information for a profile includes a username, password, and email. The optional information includes your name, website, slogan, and a profile photo. The profile photo should absolutely be required. Many users are not signing up with a photo, so your feed could be a matrix of just black thumbnails with a random photo here and there. For a social iOS app, some sort of visual engagement helps. The bright, nice graphics of the Fliptape iPhone app become depressing when presented with a bunch of black squares. The Fliptape iPhone app does include a nice introduction by a fun robot. You use horizontal swipes to move through the introduction. It includes concise information regarding gestures and tools. The home screen has a nice layout with easily understood icons, but the feed of black squares of fellow Fliptape iPhone app users grabs your attention. At the top left corner of the screen, there is a search icon. The search icon would be great, if it worked properly. I turned my iPhone on and off, exited in and out of the iPhone app, and sent up smoke signals, but I couldn’t get a keyboard to pop up to enter any search for an artist or friends. The headphones icon in the upper left hand corner does, however, function well. It is your back button to move from the music play screen to the home and profile screens, as the music will play in the background. You can touch a photo, if you have one in your feed, or a black thumbnail to start music or go to a profile. If a playlist is linked to the photo, then it will start playing. If you touch a photo to go to a profile, then you will find a list of a user’s music. The music screen is visually striking, and it incorporates nice features. You can play a song on repeat, favorite, and shuffle. You can also rewind, pause, and fast forward. All of these features are accessed with one touch on the appropriate icon. The problem I encountered was the unpredictability of the play. I listened to one song from one user. When the song ended, I had to find another song and press play. I listened to one song from another user, and then the next song automatically played. Fortunately, the playlists I listened to worked perfectly, and I really liked the quality of the audio. From the bottom of the screen, you can access your Spotify account and profile. When you touch the music icon, a list of your existing playlists and access to search Spotify. Unfortunately, a keyboard did not pop-up to allow me to search. 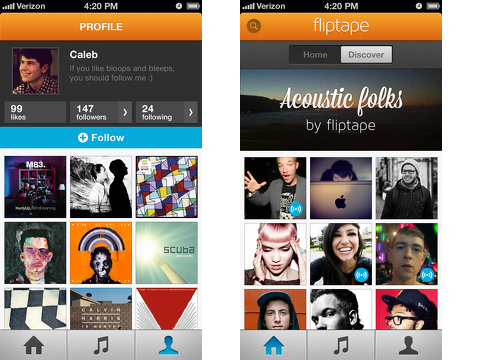 Your profile is reminiscent of a Pinterest profile with your photo, name, likes, followers, following, and thumbnails of music shared in Fliptape. A nice touch is the settings icon nestled just above the matrix of thumbnails to streamline the interface. The intention of the Fliptape iPhone app is very cool and fun, but it just needs some finessing. If there is a way to incorporate more curated playlists or ask you to select some music preferences to generate links to more great playlists, that would improve the social experience. Make people add a photo to eliminate the sad, black boxes. But, perhaps most importantly, if the point of a social music iOS app is to help you discover music, then, at a minimum, fix the search bar interface problem. AppSafari review of Fliptape was written by Jenni Ward on June 19th, 2013 and categorized under App Store, Free, Music, Social. Page viewed 6360 times, 2 so far today. Need help on using these apps? Please read the Help Page. A friend gave me this app and I liked it. Very useful for songs. Thanks!